599 – It’s about time! Whats the point of the alt-text if it appears as regular text anyway? The RSS feed doesn’t carry the mouseover text. People are missing out. Yeah, (x, why? )’s got the reason right there. This is so that RSS readers (who are slightly in the majority) can get the alt-text experience. Actually, I might drop the alt texts entirely and just have the text under the comic. The joke of the comic is really dated, but the alt text made me laugh. Ha ha, I found the text accompanying the comic quite funny. Thank you for making it show up in the RSS feed again. Well, that comic was rather short. Yea but it looks like a potentiometer to those of us who MATTER! Resistance may be futile, but without it it’d be a short circuit. All this time, I’ve been learning the US symbol in school? I didn’t even know we Europeans had a different symbol!!! That is a variable resistor. 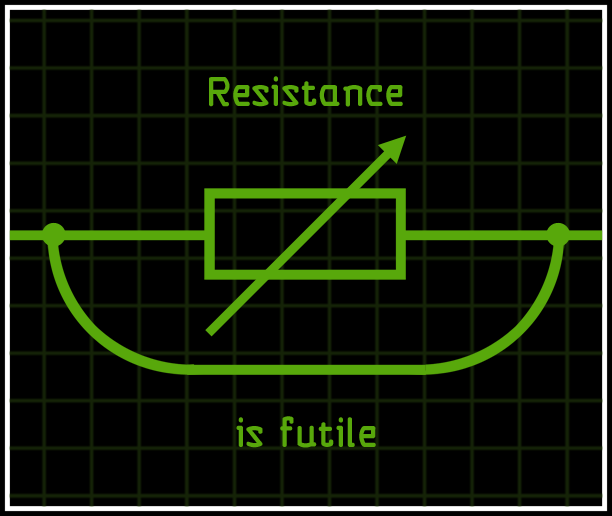 So you have in fact done “Variable resistance is futile.” Doesn’t have quite the same ring to it.